The following content is from team member Andy's recently completed MBA thesis on sustaining the quality and product value of Traditional Taiwan Tea in the midst of a growth industry. The research involved was the establishment and development of Eco-Cha. You can read the abstract of the thesis here. What we are most inspired to share, however - is feedback from professionals in the field here on the ground. These are people that we have known and learned from for years, and even decades. Following are the translated and summarized responses from Taiwanese professionals whose research and work in the field have been cited. These responses are based on open-ended questions regarding these individuals’ perceptions of our work in the field to date in the form of our branding and representation of the Taiwan tea industry. They were asked to comment on the strong and weak points of Eco-Cha, Inc. and the ability of a foreign-based company to represent the industry and the specialty product of Taiwan tea, with an emphasis on promoting traditional, artisan tea on a small, privately-owned scale of production. 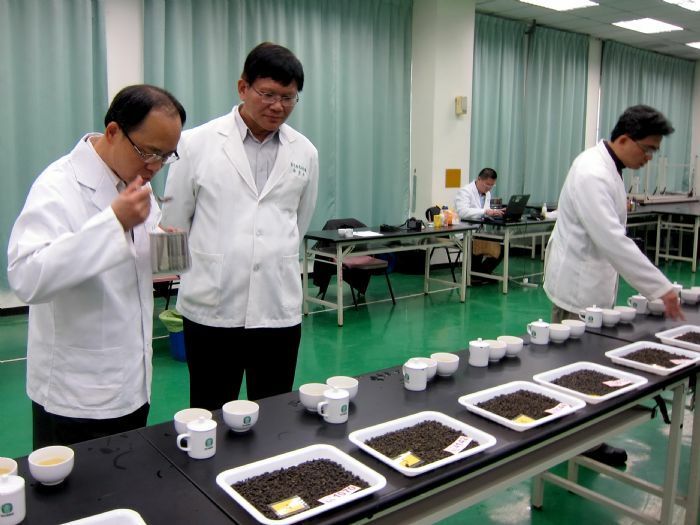 Taiwan Research Extension Station members during a tasting. "Eco-Cha, Inc. specializes in marketing Taiwan specialty teas. Currently, its product line primarily represents all the regions of Central Taiwan that produce specialty teas, including low, middle and elevation tea producing areas. They offer a balanced representation of traditional oolong teas along with newly developed, fresh, fragrant oolong types. This company has spent a great deal of time and effort in these tea producing regions engaging in the industry at the source - going to remote mountainous regions to understand production and processing methods, and occasionally consulting with professionals in the field." "In addition to providing all types of premium quality, health promoting specialty Taiwan teas, it also provides accurate and detailed information and specialized knowledge about the industry to the consumer on an international platform. Eco-Cha is a professional company in the field of marketing and promoting Taiwan Tea." The Distinct Aspects of Eco-Cha Inc. in the Marketing of Taiwan Tea. "The early stage of tea production in Taiwan was mainly for purpose of export. The governmental policy was to separate factory and farm. All of the fresh tea produce was sold to tea factories to process for an export market. This was the state of tea production before the economic development of Taiwan. The industrial development of Taiwan both resulted in an insufficient agricultural labor force which increased production costs and also created a new domestic demand for tea. The tea industry transitioned from a government regulated export industry to a privatized domestic industry. Hence, the purpose of the Tea Research Extension Station has been to develop new strains of tea and to consult with tea farmers on agricultural management and the self-promotion of their specialty product. TRES has also promoted the development of origin-specific specialization of tea types utilizing the pre-existing knowledge of tea farmers and facilitating the education and preservation of this traditional knowledge. Today, Taiwan tea farmers have their own specialized skill sets as a result. This has given Taiwan tea an added value and competitive edge in the marketing of their tea." "Nowadays, when you visit tea producing regions of Taiwan, you encounter ubiquitous family-run businesses – cultivating their locally-specialized types of tea, manufacturing it, roasting it, selling it, brewing it, and representing it all on their own. This is the cultural foundation of the Taiwan tea industry. This is the personal, authentic self-image that the Taiwan tea industry has developed which stands in contrast to the large-scale production of foreign tea industries. If the local industry can simply maintain these unique qualities and preserve the traditional culture of their industry, it can survive and thrive on this differentiating factor." "Eco-Cha promotes this specialized local quality in marketing Taiwan tea. It differentiates between the small, privately run tea industry and the large-scale commercial industry. Not only does this company establish this differentiating factor for itself in the marketing of its tea, but it can also demonstrate this method to the local industry in preserving its traditional quality of production – and so cooperate in marketing this specialty product to the consumer. This cooperative effort can result in changing the consumers’ perception of Taiwan tea. By representing Taiwan tea in this way, we can offer a sustainable method of preserving not only artisan tea, but its culture and its environment from which it has grown. This is the most notable method of marketing." "Regarding the case study of Eco-Cha and the feasibility of representing traditional Taiwan tea as its core promotional means: I recall that the original ideology for this brand was the promotion of organic tea. Given the geographical restrictions of agriculture in Taiwan and the difficulty of producing certified organic tea, it is not a sensible prospect. Tea is a specialty beverage for aesthetic appreciation, and organic does not define quality in this respect. As for safety and health considerations, combined with traditional culture and specialty quality, Eco-Cha’s representation of Taiwan tea is a highly viable method as well as a significant contribution to the development of the industry." "The development of high mountain tea in large-scale production has impacted traditional tea production by causing a homogenization of specialty teas, and a loss of specialized, cultural value. Eco-Cha represents small volume, privately run farms with an emphasis on traditional types of tea. These qualifications of production are actually what define Dong Ding Oolong Tea." "The modern consumer demands transparency regarding all steps of production in the making of a specialty product in order to more fully comprehend its unique value. Eco-Cha embodies this perspective in researching the sources of its product line and meets these demands." To improve the Eco-Cha blog, I suggest that you add more photos representing the local culture that is connected to tea such as night markets, temples, scenery, etc. Use story telling as a style of presentation, in this way those who browse your website will more easily accept your marketing of Taiwan tea. Continue in your dedication to what you love about Taiwan, and I am convinced that your future in marketing Traditional Taiwan Tea will progress day by day. Currently, your direction and conduct of marketing is correct in that you are more able to represent a cooperative effort with the artisans of traditional Taiwan specialty teas."